At this time, Cooltech Refrigeration Inc.ships merchandise to locations within the United States , excluding Alaska, Hawaii, Puerto Rico, Guam, and the US Virgin Islands.The risk of loss and title for all merchandise ordered on this Web site pass to you when the merchandise is delivered to the shipping carrier. We accept major credit cards and Paypal as well. To place an order over the phone or to our brooklyn locations, please contact us at the numbers below. We ship to 48 continental states. For customers outside of NYC, please contact us for shipping quote before placing the order. Connect with us on Facebook, MSN or Google Talk! Cooltech Refrigeration warrants to the original purchaser of Cooltech Refrigeration branded equipment, including all parts thereof, that such equipment is free from defects in material and workmanship, under normal use and service as indicated by Cooltech Refrigeration installation and operation instructions, for a period of one (1) year from the date of installation. For the purpose of this warranty, the original purchaser shall be deemed to mean the individual or company for whom the product was originally installed. Our obligation under this warranty shall be limited to repairing or replacing, any part of such product which proves thus defective. Cooltech Refrigeration reserves the right to examine any product claimed to be defective. If after review the product is not deemed defective, Cooltech Refrigeration reserves the right to deny payment for repair. Any part determined to be defective and requested to be returned should be returned to the company within thirty (30) days under the terms of this warranty. Purchaser is responsible for all shipping charges of the faulty part back and forth Cooltech Refrigeration for repair or replacement. For local purchases only. On top of the Limited One (1) Year Warranty (Parts and Compressor), Cooltech Refrigeration warrants to the original purchaser of Cooltech Refrigeration branded equipment, whose operation located within 60 miles of Cooltech Refrigeration (zip code 11232), including all parts thereof, that such equipment is free from defects in material and workmanship, under normal use and service as indicated by Cooltech Refrigeration installation and operation instructions, for a period of one (1) year,including labor, from the date of installation. For the purpose of this warranty, the original purchaser shall be deemed to mean the individual or company for whom the product was originally installed. Our obligation under this warranty shall be limited to repairing or replacing, any part of such product which proves thus defective. Cooltech Refrigeration reserves the right to examine any product claimed to be defective. If after review the product is not deemed defective, Cooltech Refrigeration reserves the right to deny payment for repair. This warranty shall not be assignable and shall be honored only in so far as the original purchaser. This warranty does not apply outside the limits of the United States of America, nor does it apply to any part which has been subject to misuse, neglect, alteration, accident, or to any damage caused by transportation, flood, fire, or acts of terrorism, or acts of God. Before requesting any service on your Cooltech® unit. Please refer to Owner's Manual section under the Terms and Conditions. Lack of maintenance or misuse is not covered under warranty and also may void warranty. Cooltech Refrigeration or their affiliates shall not be liable for any indirect, incidental, special or consequential damages, or losses of a commercial nature arising out of malfunctioning equipment or its parts or components thereof, as a result of defects in material or workmanship. Installations outside the United States. Appearance features, aesthetics, paint and cabinet parts, knobs and buttons. It is the responsibility of the purchaser to establish the original purchase date for warranty purposes. We recommend that a bill of sale, cancelled check or some other appropriate Payment record be kept for that purpose. 1) If the unit has recently been transported please let unit stand still for a minimum of 24 hours before plugging it in. 2) Make sure that the unit drops down to desired temperature before loading the unit with product. 3) Make sure that there is proper ventilation around the unit in the area where it will operate. 4) Make sure all accessories are installed (i.e. shelves, shelf clips, casters) before plugging the unit in. 5) Please read through the Operation/Owner’s Manual in its entirety. Lack of maintenance or misuse of the unit will VOID warranty. Please fill out the registration card and send it to the factory. Please ensure that the required voltage of the compressor is being supplied at all times. Low or high voltage can detrimentally affect the refrigeration unit and thereby void its warranty. overcurrent protection. Please refer to the electrical requirements on the unit serial tag located inside the unit. Please make sure that your unit has its own dedicated outlet. Do not use an extension cord. For efficient operation, it is important that the condenser surface be kept free of dust, dirt, and lint. Condensers accumulate dirt and require cleaning every 30 days. If you keep the condenser clean, you will minimize your service expense and lower your electrical costs. A dirty Condenser can result in NON-WARRANTEED part & compressor failures, product loss, and lost Sales. The Condenser looks like a group of vertical fins. You need to be able to see through the condenser for the unit to function at maximum capacity. Do not place filter material in front of condensing coil. This material blocks air-flow to the coil similar to having a dirty coil. 1. Disconnect the electrical power to the unit. 2. Remove the louvered grill. 3. 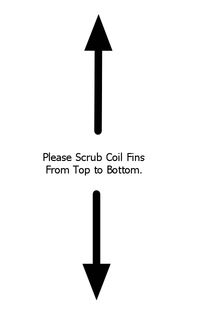 Vacuum or brush the dirt, lint, or debris from the finned condenser coil. 4. If you have significant dirt build up you can blow out the condenser with compressed air. 5. When finished be sure to replace the louvered grill. The grill protects the condenser. 6. Reconnect the electrical power to the unit. If necessary, clean the fan blades and motor with a soft cloth. 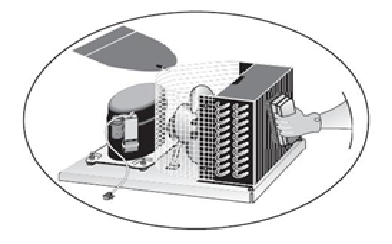 If it is necessary to wash the fan blades, cover the fan motor to prevent moisture damage. When cleaning the cabinet interior, use a solvent of warm water and mild soap. Do not use steel wool, caustic soap, abrasive cleaners, or bleach that may damage the stainless steel surface. Wash door gaskets on a regular basis, preferably weekly. Simply remove door gasket from the frame of the door, soak in warm water and soap for thirty (30) minutes, dry with soft cloth, and replace. Check door gaskets for proper seal after they are replaced. Periodically remove the shelves and pilasters from the unit and clean them with mild soap and warm water. To remove the pilasters, first remove the shelves and shelf clips. Then, unscrew the pilaster with a phillips screwdriver and remove. Disconnect power cord before cleaning any parts of the unit. Please note that this guide serves only as a reference for solutions to common problems. Before requesting any service on your Cooltech® unit, please check the following points. Service calls resulting from lack of maintenance or misuse is not covered under warranty and also may void warranty. Wait for defrost cycle to finish. Condensing unit runs for long periods of time. Excessive amount of warm product. Allow adequate time for product to cool down. Prolonged door opening or door ajar. Ensure doors are closed when not in use. Avoid opening doors for long periods of time. Door gasket(s) not sealing properly. Ensure gaskets are snapped in completely. Remove gasket and wash with soap and water. Check condition of gasket and replace if necessary. Unplug unit and allow coil to defrost. Make sure thermostat is not set too cold. Ensure that door gasket(s) are sealing properly. Cabinet temperature is too warm. Re-arrange product to allow for proper air flow. Make sure there is at least four inches of clearance from evaporator. Avoid opening doors for long periods of time. Locate and tighten loose part(s). Ensure tubing is free from contact with other tubing or components. Please pay close attention to the safety notices in this section. Disregarding these notices may lead to serious injury and/or damage to the unit. To minimize shock and fire hazards, be sure not to overload outlet. Please designate one outlet for your unit. Do not put your hands under the unit when the unit is required to be moved. When the unit is not in use for a long period of time, please unplug the unit from the outlet. After unplugging the unit, wait at least 10 minutes before re-plugging it. Failure to do so could cause damage to the compressor. To minimize shock and fire hazards, please do not plug or unplug the cord with wet hands. During maintenance and cleaning, please unplug the unit. To minimize shock and fire hazards, make sure that the unit is properly grounded. Do not attempt to remove or repair any component unless instructed by factory. Make sure that the unit is not resting on or against the electrical cord and plug. To minimize personal injury, do not hang on the doors. Do not store any flammable and explosive gas or liquids inside the unit. Do not attempt to alter or tamper with the electrical cord. All Cooltech Refrigeration products ship under 110 freight classifications. It is the customer's sole responsibility to ensure that the product is received in good condition. Buyer should uncrate and carefully inspect for freight damages before signing off the driver. Failure to do so will result in difficulty when filing a claim with the freight company. Driver should be made aware of the damages before leaving customer's location. Bill of lading should be noted and signed (all copies) by buyer and the driver. We are not responsible for any repair or service bill due to freight damage if the customer fails to mark 'damaged' on freight receipt before the driver leaves. We will, however, help the customer to file for freight claim. Inspect shipment for any damage. If you see damage or feel there may be concealed damage, mark the carrier's copy of the freight bill 'damaged'. For visible damage do not accept delivery unless the condition is noted on your copy of the freight bill and signed by the driver. If the damage is concealed, notify the carrier within 48 hours by phone and in writing. Ask them to send their agent to complete an inspection report. Retain all cartons and merchandise for inspection. It is critical that the customer take the above actions. Item may be returned within 14 days upon receipt of the item. However, the return needs to be notified and authorized by us within 3 days upon receipt of the item. No exception. Buyer is responsible for shipping the item back to us. There will be a 20% restocking fee applied on returns of brand new items. Refund will be issued through Paypal after we receive the return and determine the item still in its original sellable new condition.